Does Raising Cigarette Excise Tax Work? HomeOpiniDoes Raising Cigarette Excise Tax Work? Increasing the cigarette excise tax is seen as one of the most powerful tools to control cigarette consumption. 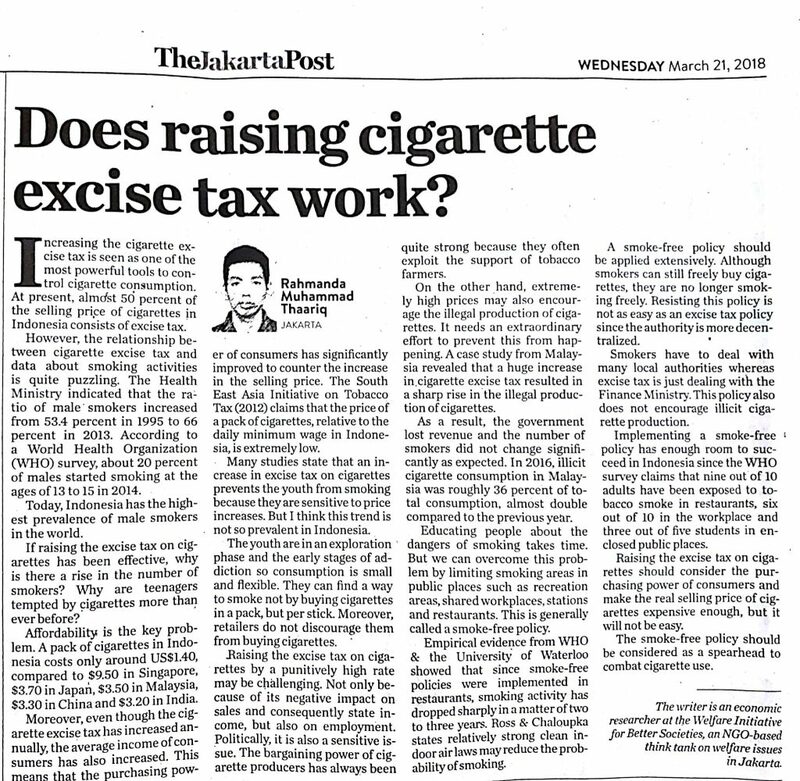 At present, almost 50 percent of the selling price of cigarettes in Indonesia consists of excise tax. However, the relationship between cigarette excise tax and data about smoking activities is quite puzzling. The Health Ministry indicated that the ratio of male smokers increased from 53.4 percent in 1995 to 66 percent in 2013. According to a World Health Organization (WHO) survey, about 20 percent of males started smoking at the ages of 13 to 15 in 2014. Today, Indonesia has the highest prevalence of male smokers in the world. If raising the excise tax on cigarettes has been effective, why is there a rise in the number of smokers? Why are teenagers tempted by cigarettes more than ever before?